Eat Memphis served a Thanksgiving feast to the needy. On an average day, the number of people experiencing homelessness in Memphis could fill just about every one of the Orpheum Theatre's 2,000 seats. Eat Memphis, a new grassroots organization, has a goal to feed nearly half of those people by Christmas day. 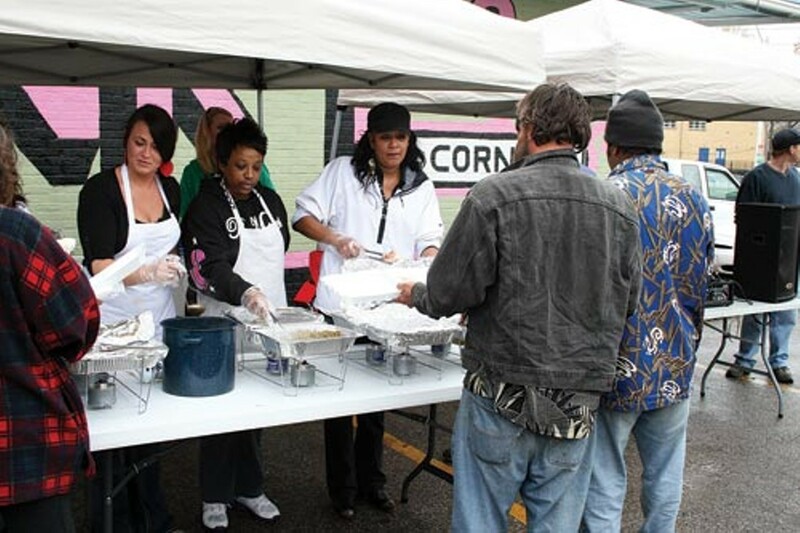 Launched in October, Eat Memphis hosts monthly meals for the city's homeless population. Founder Cortez Currie was once homeless himself. While he was on the streets, he noticed a lack of resources for the homeless. "I've lived in a shelter and lived in my car," Currie said. "I know the feeling to have someone outside of your element do something from their heart, as far as feeding a meal, talking to you, and trying to help you if they can." Eat Memphis is having its next feeding event on December 23rd at the Evangel Temple in South Memphis from noon to 3 p.m. with a goal of feeding 300 people. The organization will also be selling smoked holiday hams to raise money for future serving events. Hams may be reserved at hamsforthehomeless.com and picked up at Shelby Farms from 11 a.m. to 2 p.m. on Christmas Eve. "The ultimate goal is to get more people fed and make them happy. The more people that we can do that with, the better off we're all going to be," said Eat Memphis member Kevin Martin. The first serving operation was held on October 1st at E.J. Corner Store on North Cleveland. The group planned to feed 100 people, but they ended up exceeding their goal by giving out 150 meals. More meals were provided on Thanksgiving, but the group fell 50 people short of their goal of feeding 200. "Getting out there and seeing the smiles, it was nice. It was a very humbling experience. We made a lot of people happy, which makes me happy," said Martin, who donated 200 pounds of turkeys during the Thanksgiving feast. The group originally set out to feed 1,000 people by Christmas day, but if they manage to meet their goal of 300 at the next event, they'll still be about 400 people shy. A typical meal from Eat Memphis includes an entrée of meat, vegetables, fresh fruit, and a beverage. Some food is donated by local businesses, but Eat Memphis' members also spend some of their own money to pay for ingredients. The organization is currently looking for more volunteers, sponsors, and donations. In January, the organization is launching Eat Healthy Memphis, an initiative aimed at improving the quality of food provided to the homeless and needy. Currie said ultimately, through Eat Memphis, members are creating a more positive image for the city by improving conditions for those in need. "We're not just striving to fight poverty and hunger," Currie said. "We're fighting to keep families together and to get people out of the streets and [moving] into a more positive direction. If we really get behind this, it could change people's lives." Starlito & Don Trip: artistic “stepbrothers” and collaborators. Xavier Wulf Drops "New Notification"